Some people enjoy running in the sunshine, some people enjoy running in the snow, some people enjoy running in the rain and some enjoy running through autumn leaves. Where am I going with this? 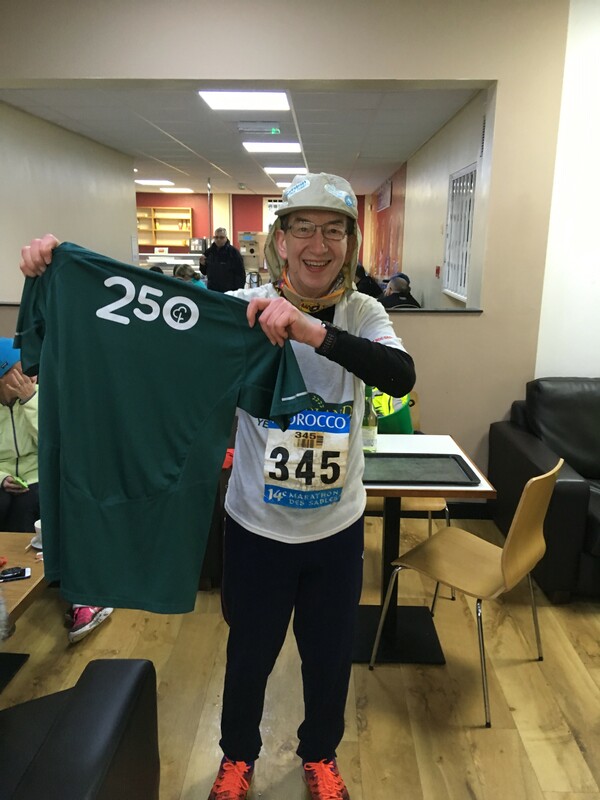 Well, this weekend Arrow Valley parkrunner Doug RICHARDS completed his 250th parkrun at Arrow Valley and I bet in those 250 Saturday mornings he has run in all of these conditions from the sunshine of June or July and the snow of December (or March). 250 parkruns, 1250 kms, 775 miles, hundreds of new friends and plenty of other adventures. For anyone who wants some running inspiration, give his book a read which includes running in the sand in the desert, talk of elephants and plenty of other stories. Keep an eye out for edition 2 coming soon (I hope!). Well done Doug, we salute you and thank you for the cake. Welcome to the club! Looking on the Facebook list of pacers, the closest to their “pacer” time was Anita HARTLEY who was pacing 32 minutes and crossed the line in 32:01. Finally, to the marshals on the course – Thank you, I’m so glad the torrential rain which I saw forecast for Saturday did not happen!! 50 club – Andrew EDGINTON – Andrew has completed 47 events at Arrow Valley, 2 at Dolgellau and 1 at Hanbury hall. There were also celebrations for Hayley GWILLIAM’s 50th parkrun. Hayley has completed 36 at Arrow Valley, 5 at Hanbury Hall and Cannon Hill parkrun and 1 at Dudley, North Beach, Brueton and Gunnersbury. 100 club – Nick PRICE – Nick has completed 97 events at Arrow Valley, 2 at St Andrews parkrun and 1 at Ganavan Sands. This week there was 74 personal bests recorded. 29 first timers took part this week, for 12 of them this was their 1st parkrun. The most experienced parkrunner for whom this was their 1st time at Arrow Valley was Paul COOPER who completed his 208th parkrun at his 8th location. His home parkrun is Brueton parkrun which he has completed on 199 occasions. Paul completed his parkrun in 140th position in 26:37. This week 430 people ran, jogged and walked the course, of whom 29 were first timers and 74 recorded new Personal Bests. Representatives of 38 different clubs took part. The female record is held by Becky STRAW who recorded a time of 17:49 on 23rd August 2014 (event number 110), and by Kristen FINDLEY who also recorded a time of 17:49 on 25th July 2015 (event number 159). The male record is held by Unknown ATHLETE who recorded a time of 15:08 on 10th September 2016 (event number 219). The Age Grade course record is held by Bronwen G CARDY who recorded 94.03% (21:14) on 12th September 2015 (event number 166). Arrow Valley parkrun started on 14th July 2012. Since then 8,105 participants have completed 72,901 parkruns covering a total distance of 364,505 km, including 13,104 new Personal Bests. This entry was posted in Run Reports by arrowvalleyoffice. Bookmark the permalink.